What can I catch from my pets? First though, some general advice for all diseases. Some are more important than others. Most won’t be suspected by your doctor without your help. The great scare story loved by current affairs shows on quiet news nights. Your cat may kill you and your baby! Of course it’s not that simple or scary. Most toxoplasmosis in people is believed to be caused through eating undercooked meat or not washing hands after gardening. And most toxoplasmosis is so mild you don’t realise you had it. The bug did come from a cat originally, but in this case is spread to us via eating another animal or cat faeces in the yard. Kittens and outdoor, hunting cats may be more likely to spread the bug around. Even here, cats keep themselves so clean it’s still very unlikely you can get it directly from the cat’s fur. You can’t really catch pet worms the way pets can. Most parasites are fairly fussy about who they live in. What larval worms can do is burrow into your gut or skin and have a jolly good time migrating around. These conditions, called covert toxacariasis, cutaneous or visceral larva migrans, chiefly affect children and can irritate the skin or cause damage to sensitive areas such as the eye or the brain. Even worse is the hydatid tapeworm. Movie buffs will recall the Alien series. This fun little fellow gets in as an egg via faeces from an infected dog, then hatches and looks for a home. It then forms a cyst, which gradually enlarges sometimes to great size. Dogs infected with hydatid tapeworm are usually country dogs, with poor worming treatment and a history of being fed raw offal. This parasite has been eradicated from Tasmania, so you need to prove you have wormed your dog if travelling there. Read more about the worms of dogs and cats here. No, we aren’t calling ‘getting scratched by your cat’ a disease. There is actually a specific bacteria found in some cat scratches which can migrate to the lymph node and cause a large swelling or abscess. As dramatic as it looks, it usually gets better by itself in a person with normal immune system function. This bug may be spread between cats by fleas, so here’s another good reason to use flea control. You can’t blame our ancestors for not knowing, but hopefully everyone now realises ringworm is actually a skin fungus, similar to athletes foot etc. This may be the most common disease caught from pets. Guinea pigs and young kittens from shelters seem to be the major source. On humans, it usually starts as a red sore and grows in a roughly circular shape. On cats and guinea pigs it typically causes scaly hair loss. 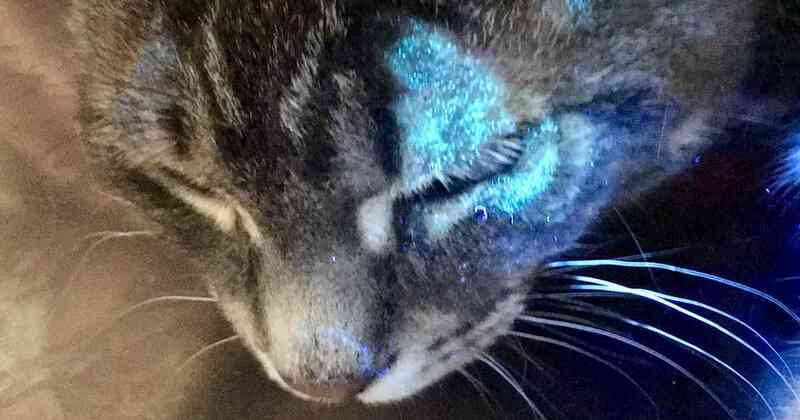 The picture at the start shows a cat with facial ringworm under ultraviolet light. As you can see, the common feline species often fluoresces an apple green colour. The good news is that it’s easy to treat and once you’ve had a particular type, you are usually immune (for example, I never get it even though I handle ringworm a lot). The bad news is that cats get blamed for human ringworms all the time when they are not guilty. Guess what? Humans have their own ringworms too! Coxiella burnetii is a small bacteria which causes severe flu-like symptoms in affected people. Until recently it was thought to be mainly a problem to people during large animal obstetric procedures. We now know that cats can carry the cause of Q fever and spread it via urine or when giving birth to kittens. High risk groups include cat breeders and animal shelter workers. Consult your doctor about vaccination if you are in either of these groups. No animal disease has ever made me more unwell than psittacosis. I caught it from a Sun Conure, but you can easily get it from any parrot, especially if they have been stressed by a recent time in a pet shop. It’s probably much like Q fever: like a terrible influenza with all the aches, chills, fever and delirium. This disease is famous for wreaking havoc in nursing homes and can even kill if the doctor doesn’t make the connection in time. Thankfully, it’s easily treated once the diagnosis is made. OK, this isn’t the regular human scabies, but a very similar Sarcoptes mite exists in dogs which can infect people. I guess the message here is that if you have an itchy dog, and you’re starting to scratch, get them to a vet. And you to a doctor. Giardia, Salmonella, Campylobacter, E. coli. Here is the area where humans and pets probably can share the most diseases: Diarrhoea. In my house, there’s a simple rule: you wash hands before eating every time. And if you give that puppy a little pat on the way to the dinner table, back you go and wash them again. The trick with all these diseases is that they started in poo. If you keep good hygiene, you’re at least half way there. Giardia is a protozoan parasite which is found in many species, but especially stray cats and puppies from poorly managed breeders and puppy farms. It can cause an annoying persistent diarrhoea and loose stool in humans. Salmonella, Campylobacter and E. coli are all bacteria which can be found in pet faeces. Particular concern should be around dogs on raw chicken diets, cats eating raw chicken or anytime with rodents, birds or reptiles. Read more causes of diarrhoea in dogs here. Steptobacillus moniliformis is part of the normal bacteria found in rats’ mouths. Infection is acquired not just by a rat bite but even just close contact with rats. Symptoms of fever, headache and a rash develop and can be severe. One thing I know about anti-vaxxers: they haven’t had much to do with tetanus. If they had seen it I doubt they’d take any chances; it’s a horrific disease. Tetanus is of course often acquired by contaminated wounds. If you get a nasty cat scratch or animal bite, see a doctor and check that your tetanus vaccination is up to date. I never let mine get out of date. I put this one in but it’s really what your ferret can catch from you! I have seen ferrets with influenza, and you only have to look at the owners to see where they got it from. There are other diseases, but these are the main ones you should know about. To finish I want you to know about the diseases you’ll hopefully never catch and why. Brucellosis and Bovine Tuberculosis were both major causes of death and chronic illness in people in Australia. Vets like my father spent a large part of their days in the 1970s and 80s testing herd after herd of cattle across the country in a massive operation called the Brucellosis and Tuberculosis Eradication Campaign. It was so successful that Australia is now free of these diseases. Rabies would be absolutely catastrophic if it got into the dingo or fox populations in Australia. Only good quarantine has kept us free of one of the most feared diseases in human history. We are not completely free of rabies though: read here about some diseases carried by bats in Australia. Lastly, I’m glad I’m not a doctor (people- yuck!) but it does mean I’m not an expert on diseases of people. If you have any concerns about your own health, please see your trusted doctor. If you have a disease which may cause immunosuppresssion please discuss whether you should keep pets at all.